The last several decades have seen remarkable advances in the clinical neurosciences, with some of the most remarkable achievements related to neuroimaging. Given the current depth of knowledge about the brain, it is difficult to appreciate that barely 300 years ago this organ was almost a complete mystery, particularly as to its function. While the brain has been recognized as an “organ” since antiquity, no functional role was ascribed to it until the early 1600s, when Descartes placed the “soul” in one of its small parts, the pineal gland. Prior to this intriguing, but erroneous, concept, much more functional importance had been attributed to the fluid in the ventricles than to the brain itself. Descartes’ non-scientific attribution was, fortunately, quickly followed by the much more rigorous description of the structure of the brain by Thomas Willis in 1664. While Willis’ application of the scientific method to the brain was seminal, the primitive scientific tools available at the time limited his direct observations to anatomy, and gross anatomy at that, which in and of itself does not convey function. Despite little direct evidence, Willis began to argue that mental functions reside in the brain, as do certain diseases such as epilepsy. The scientific tools necessary to prove his assertions by actual observation of physiology, molecular biology, and other “functional” aspects of the brain were still several centuries away. However, the brain was found to have a peculiarly strong correlation between structure (anatomy) and function (behavior). This intimate relationship provided the basis for the still robust field of “experimental” neuroanatomy. Experimental neuroanatomy, such as the destruction of a portion of the brain in an animal followed by observations of its behavior, allowed eighteenth and early nineteenth century scientists such as Gall and Rolando to make structure–function correlations that documented the brain as a central control organ. [3,4] Since it has never been appropriate to perform debilitating experiments on humans, many fundamental questions pertaining to human brain function persisted until the “natural science” version of experimental neuroanatomy was introduced by clinicians such as Morgagni, who attributed neurological deficits such as hemiparesis to grossly destructive or functionally disruptive lesions of patients’ brains found at autopsy. Broca, in 1860, applied such lesion–deficit correlation to a patient who had suffered the acute onset of aphasia and whose brain at autopsy revealed an infarct in the right frontal operculum, thus localizing a component of speech to a particular cortical region. Such “dysfunctional” imaging was subsequently employed by many clinical scientists, particularly those nineteenth and early twentieth century neurologists whose names are attached to so many neurological syndromes. While lesion–deficit correlation has been a very informative means of studying the brain, it is limited by its anatomical basis, which does not provide any direct information about the brain’s physiology or molecular makeup. Note that all of these early methods of studying the brain involved some form of imaging. Given the spatially heterogeneous nature of the brain (both structurally and functionally), imaging of the brain is an absolute necessity in order to document the location of an experimental or natural lesion. Only with this anatomic information could the observed neurological, psychological, or cognitive dysfunction be linked to its physical source. In humans, these types of investigation were severely restricted by the unfortunate necessity of a patient having to suffer an insult to the brain and the additional burden that the patient either dies having permitted an autopsy or submits to a craniotomy. These were until very recently the only means of directly documenting the presence and extent of a brain lesion. in 1906, laid the groundwork for the modern “neuron doctrine” and the cellular basis of many neurological diseases. Histological stains steadily evolved from non-specific morphological enhancers such as the hemotoxylin & eosin (H&E) stains to refined histochemical indicators such as today’s imunohistochemical techniques, which demonstrate specific proteins in their cellular milieu. Gross and microscopic morphological discoveries were accompanied and complemented by functional, neurophysiological studies, such as those of Sir Charles Sherrington, that confirmed the neuron as a discrete, functional element of the brain. However, many of these newer techniques had, and continue to have, restrictions to their applications in humans, particularly intact, functioning humans. Histological techniques require tissue, which is never easily obtained from human brain and almost never from multiple or large regions. Many neurophysiological techniques require intrusion into the brain, such as for electrode recordings or cortical stimulation. Molecular techniques are seldom feasible in intact functioning brain. While these powerful techniques provide extraordinarily detailed information about small parts of the brain, none provide data from the entire, functioning brain. This is a significant limitation as many functions of the brain involve composite actions of its many spatially, physiologically, and biochemically disparate components. This is particularly true of complex behavioral tasks and cognition. The spatial heterogeneity of the brain has always begged for imaging of the whole organ, preferably in the intact, functioning state. This has not been feasible until very recently. In 1974, clinical neuroscience experienced a profound change with the invention of the X-ray computed tomography (CT) scanner, an instrument that for the first time could non-invasively produce images of the whole, living human brain. These CT scans are based on electron density, and there are only subtle differences of this parameter in the brain. For instance, the electron density of gray matter (GM) and white matter (WM) differ by only 0.5%. Hence, clinical CT scans yield relatively crude images of the brain. However, these relatively crude CT images allowed neuroscientists to see not only the normal human brain but also a broad spectrum of neuropathology. Brain tumors, strokes, and abcesses could be seen without the need for craniotomy or autopsy. As a result of this remarkable new machine’s ability to demonstrate the precise locations of brain lesions, the previously important practice of “surgical neurology” disappeared. While CT scanners can only image morphology at relatively low contrast and spatial resolution, the technique allowed the traditional lesion–deficit methodology to be applied to living subjects contemporaneously with functional examinations. Autopsy and craniotomy are no longer necessary to demonstrate the anatomical correlates of functional deficits, and the literature has become replete with lesion–deficit studies that have expanded our knowledge of how the function of the human brain is spatially distributed. Investigators such as the Damasios have used clinical CT, and later magnetic resonance (MR), scans of hundreds of neurologically, psychologically, and cognitively impaired subjects to better demonstrate the anatomic substrate of higher order mental tasks. However these images still show only static anatomy and do not reflect any physiological or molecular aspect of the brain. Indeed it can be difficult to tell a conventional CT or MR scan of a cadaver’s brain from that of a living person. While we now understand many strong relationships between the gross structure and function of the brain, there remains the overpowering need to be able to directly “see” physiological and molecular functions of the brain. After all, it is more important to know what the brain is doing than what it looks like! The need for functional and molecular imaging of the brain was initially met by the combination of positron emission tomography (PET) and metabolic radio tracers such as [18F]-fluoro-2-deoxyglucose (FDG), H2O15, and CO15. The PET methodology allows non-invasive imaging of the whole brain under resting as well as task conditions. Physiological parameters, such as cerebral blood flow (CBF), can be imaged non-invasively in the clinical environment, as can responses of these parameters to activation of the brain by a task: direct imaging of dynamic brain physiology. In addition, radio ligands have been developed that produce images of the distribution of specific molecules in the brain, such as components of neurotransmitter systems. This methodology remains a powerful research tool, albeit expensive and logistically challenging. The development of PET imaging was followed relatively quickly by magnetic resonance imaging (MRI). This technique derived from nuclear magnetic resonance (NMR), a physical phenomenon related to the behavior of atomic nuclei in the presence of a magnetic field, which was described by Bloch, Hansen, and Packard in 1946. During the 1940s and 1950s many investigators developed techniques that allowed this physical phenomenon to be exploited for the study of chemical structure. Since the introduction of the Fourier transform (FT) technique by Ernst in 1966 and the development of high-field superconducting magnets, NMR has been able to elucidate the detailed chemical structure of even large molecules such as proteins. The addition of magnetic field gradients to the requisite static magnetic field of NMR can spatially define a sample, allowing MRI. This concept of the use of magnetic field gradients to generate images was first demonstrated in the landmark 1973 paper by Lauterbur . In 1976, Ernst introduced the principle of two-dimensional FT NMR, which is now almost universally used for all MRI. this quite remarkable and completely non-invasive and safe technology. However, there is little useful physiological information in the conventional MRI signal, except for that related to fast-flowing fluids such as blood. Recent MRI advances have focused on the development and application of molecular and physiological imaging capabilities. These new MRI methods are the focus of this volume and reflect the continuing evolution from purely anatomical to physiological and molecular imaging of the brain. The three main advanced MR methods to be presented are MR spectroscopy (MRS), diffusion MR, and perfusion MR, with its near relative, functional MRI (fMRI). Magnetic resonance spectroscopy yields images of the distribution and concentration of naturally occurring molecules such as N-acetyl aspartate (NAA) (one of the most abundant amino acids in the brain, and believed to be localized predominantly in neurons and their processes), choline (Cho) (a key constituent of cell membranes), and lactate (Lac) (a reflection of anaerobic metabolism). Diffusion MRI demonstrates regions of normal and pathological micromolecular motion. Under appropriate conditions, these images can reflect patterns of axonal anatomy, and when applied as “fiber tracking,” this technique can turn the large, homogeneously bland regions of WM of conventional MRI into dramatic three-dimensional displays of the major axonal pathways. Using extrinsic contrast agents or intrinsic contrast agents, such as blood, perfusion MRI can create not only qualitative but also quantitative maps of various perfusion parameters, including CBF, cerebral blood volume (CBV), and vascular permeability. With slight, but important modifications, perfusion imaging techniques can, in conjunction with the performance of specific mental tasks, demonstrate local, physiological activation of the brain. Given these techniques, at last neuroscientists can painlessly, non-invasively, and safely study important physiological properties of a whole, living, functioning human brain. One can now actually see what the brain is doing, not just what it looks like. The clinical value of these physiological and molecular tools is becoming increasingly appreciated and can be illustrated by their applications to one disease – cerebral ischemia and stroke. Lactate is an important metabolic molecule of which little is produced by the brain under aerobic conditions. However, under anaerobic conditions, such as ischemia, abundant lactate may be produced and is easily detected by proton MRS. The imaging of lactate by MRS is one of the most sensitive means of detecting even mild cerebral ischemia, its presence temporally preceding irreversible ischemia and stroke. Diffusion MRI is also very sensitive to ischemia, presumably because there is a shift of extracellular water molecules into the intracellular compartment where molecular diffusion is more restricted. Even if this theory is not correct, empirically it is well established that diffusion-weighted images (DWI) show some of the earliest changes of stroke and severe ischemia. It almost goes without saying that perfusion imaging is a powerful tool for evaluating cerebral ischemia. Perfusion MRI can easily, directly, and accurately document the reduction of CBF secondary to obstructive or non-obstructive cerebral ischemia, as well as demonstrate changes in CBV that often provide additional information as to the physiological severity of the insult. Such physiological tools are increasingly necessary for the management of acute cerebral ischemia when the traditional anatomical diagnosis of “live brain–dead brain” is not adequate for directing vascular or neuroprotective treatment. 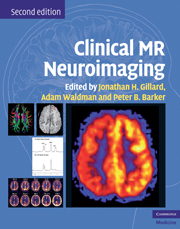 The authors of the chapters of this book describe the latest physiological and molecular MRI methodologies in detail and then illustrate their applications to major diseases of the brain, including cerebrovascular and degenerative diseases, neoplasia, seizure, inflammation, trauma, and even psychiatric disorders. These new techniques of the early twenty-first century foreshadow even more remarkable advances in neuroimaging, but first, please, appreciate the robust functional imaging capabilities so well described and illustrated in this volume. This revised edition includes updated material reflecting the increased maturity and clinical use of MRS, diffusion tensor imaging (DTI), and perfusion studies, New sections on the use of fMRI for presurgical planning as well as susceptibility and contrast-based permeability imaging are also provided. Descartes R. Rules for the direction of the mind. Discourse on the method. Meditations on first philosophy. Objections against the meditations and replies. The Geometry. In Great Books of the Western World. Vol. 31. ed. in chief Hutchins JA. Chicago, IL: Encyclopedia Britannica, 1952. Marshall LH, Magoun HW. Discoveries in the Human Brain. Totowa, NJ: Humana Press, 1998. Henry, J. Neurons and Nobel Prizes: A centennial history of neuropathology. Neurosurgery 1998; 42: 143–156. Hounsfield GN. Computerized transverse axial scanning (tomography): part 1. Description of system. Br J Radiol 1973; 46: 1016–1022. Damasio H, Damasio AR. Lesion Analysis in Neuropsychology. New York: Oxford University Press, 1989. Fox PF, Raichle ME, et al. Nonoxidative glucose consumption during focal physiologic neural activity. Science 1988; 241: 462–464. Bloch F, Hansen WW, Packard M. The nuclear induction experiment. Phys Rev 1946; 70: 474–485. Ernst RR, Anderson WA. Rev Sci Instrum 1966; 37: 93. Lauterbur PC. Image formation by induced local interactions: examples employing nuclear magnetic resonance. Nature 1973; 242: 190–191. Aue WP, Bartholdi E, Ernst RR. Two-dimensional spectroscopy. Application to nuclear magnetic resonance. J Chem Phys 1976; 64: 2229. Barker PB, Gillard JH, van Zijl PCM, et al. Acute stroke: evaluation with serial proton magnetic resonance spectroscopy. Radiology 1994; 192: 723–732. Le Bihan D, Breton E, Lallemand D. MR imaging of intravoxel incoherent motions: application to diffusion and perfusion in neurologic disorders. Radiology 1986; 161: 401–407. Rempp KA, Brix G, Wenz F, et al. Quantification of regional cerebral blood flow and volume with dynamic susceptibility contrast-enhanced MR imaging. Radiology 1994; 193: 637–641.